Crete Direct has long-term rental Traditional Houses available all year round and now several of our Holiday Villas are also available for the mild Cretan winter. For our winter programme we have selected those Holiday Villas that we think are the most comfortable and the closest to facilities but there may also be other options and alternatives available, so if you don�t see what you want do please ask. Information regarding our Traditional Houses can be found by clicking here, while full details of our Holiday Villas for winter can be found towards the bottom of this page. Warm, bright, sunny days. 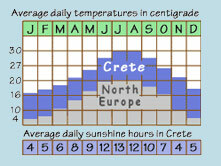 This is Cretan winter; not so much a continuous season, but a part of the year punctuated by occasional wind and rain. The climate is immediate. It becomes cloudy and rains heavily immediately - it stops raining and there is brilliant sunshine immediately. There are very few dreary, drizzly periods and the days are long and productive. The temperatures are lower than in the hot dry summer of course but the winter air is fresh and clear and above all - there is light! Crete in winter has remained something of a secret. Though one of the most southerly points in Europe it remains completely empty of visitors between November and March. But Crete is far from empty. This is a busy agricultural and fishing island and the local people continue about their business as if holidaymakers didn�t exist, because for five months in the year � they don�t! The secret endures because of perceived lack of transportation. Cyprus, for example, although a greater distance from northern Europe, has direct flights several times a day because it�s an independent nation with its own airline. Spain has a large expatriate community that can support all year round charters. Crete however, despite being a favourite holiday destination, has no charter flights after the end of October and the timetable only splutters into routine around mid-April. So Crete in winter remains a precious secret simply because there are no international flights to the island - and it�s necessary to change planes in Athens. As a result, every winter, Crete reverts to the unspoiled home of the Cretan people � and remains untouched. But you can share in the secret and join them for a while. Throughout the winter there are dozens of flights into Athens everyday from all over the world, many of them charter flights. Catch one of the fifteen flights a day to Crete by the two domestic airlines Olympic and Aegean. Following the 2004 Olympic Games, Athens has one of the most modern airports in the world and transfers of people and baggage are handled smoothly and efficiently. Of course, if you travel all the way with either Olympic or Aegean your luggage goes straight through while you wander bag-free around the shops, waiting for your connecting flight. Our car rental partners at Auto Kappa are open 365 days a year and they have special rates for winter and for long stay periods. During winter clean, quality cars are available from only �150 a week. Even better prices are available for long-stay periods. We are your experts on transportation to Crete � please just ask us. If you want to escape the cold and drizzle, want to stay for a while in a genuine Greek community, taste the winter cuisine and wines, walk in spectacular mountain scenery, wade or bathe on clean empty beaches � then this is for you. On warm sunny days just stretch and feel the benevolence of the climate � when it�s stormy, marvel at nature�s grandeur and the power of the normally mild Mediterranean sea. An absolutely authentic Cretan stone village house almost alone in a farming hamlet, high in the hills of Lousakies; 5km above Kissamos to the north and the fabulous beaches of Fallasarna to the west. Built about 150 years ago, the house has 1 bedroom, but room for another person in the spacious sitting room. Dimitra features a traditional open fireplace and is full of local historical curios and artefacts. Wonderful views - a perfect location for hiking & climbing or as a base to travel to the west of the island. cleaning and immediate food supplies for arrival. Please note that the minimum rental period over Christmas and New Year is two weeks. We are pleased to accept payment in a number of other international currencies. Please ask for rates and payment details. Click here to visit a currency converter site. A modern, traditionally-styled and beautifully built one-bedroom house adjoined by Villas Persephone and Alexandra, all sitting amid beautiful gardens and olive trees high on a hill overlooking the bustling city of Chania. Very spacious modern accommodation of a very high standard. A perfect romantic retreat for a couple. Edge of village location but close to big-city facilities. Wonderful mountain and sea views. Five minutes to beaches by car, ten minutes to the dynamic, bustling and cosmopolitan city of Chania and all its excitement - but next to beautiful walks in the hills and valleys, eventually down to the lake and bird sanctuary at Agia. and immediate food supplies for arrival. This is a huge open-plan luxury studio but the style and the furnishings along with the privacy of the building and its swimming pool, more than justifies the description as a Villa and all that suggests. It is situated on the far west coast of Crete, between Fallasarna and Chrisoskalitisa and just ten minutes from the island of Elafonisi - which can be seen from the balcony. This is our most luxurious and romantic two-person accommodation ever. The house is beautifully furnished and appointed, with air-conditioning, satellite television, jacuzzi-style bath - everything! The main features of Zo� are its complete privacy, and blend of romantic modern decor and furnishings with traditional Cretan stone and wood construction. Beautiful!! This house has a swimming pool but it may not be available all winter. Villa Athin�, near Elafonisi 8-10 persons. A spectacularly positioned new four bedroom house constructed with traditional stone and wood and located between Fallasarna and Chrisoskalitisa on the far west coast of Crete - just ten minutes from the island of Elafonisi. This is a luxury two-storey house on a large hilltop plot overlooking the west coast of Crete. Located on the outskirts of a village and a short walk to the sea. Huge living/dining room, four beautifully designed bedrooms all with en-suite bathrooms and a kitchen fitted with every modern convenience. Air conditioning. Huge terraces and spectacular swimming pool. Smart modern decor and furnishings with traditional Cretan stone and wood construction. Spacious luxury.